Arizona State University’s main campus is located in the city of Tempe, situated at the crossroads of metropolitan Phoenix and Scottsdale. ASU is a comprehensive public research university recently named the #1 School in the country for innovation by U.S. News & World Report. ASU is home to one of the largest undergraduate populations in the U.S. with an enrollment just over 38,000 full time students. Downtown Mill Avenue lines the west side of campus, a hub of restaurants, breweries and independent shops. Transportation: The nearest major airport is Phoenix Sky Harbor International Airport , just 7 miles from the center of Arizona State University. Another major airport is Phoenix-Mesa Gateway Airport , about a half hour drive from ASU. Stay: Just across from ASU, relive your college days, in spirit, at The Graduate Tempe, a boutique hotel with two dining spots-- Tapacubo and The Normal Diner plus a walk up coffee and juice bar. Kitty cornered to campus; book a room at the Moxy, launched by Marriott Hotels, a new brand of concept hotels featuring high style design with affordable pricing. For a scenic backdrop of the desert with newly renovated rooms, check into the Phoenix Tempe Marriott at the Buttes. Other good options in Tempe include: Aloft Tempe, Quality Inn at ASU, Holiday Inn Express, and Tempe Mission Palms Homewood Suites. For hotels in Phoenix and to see ASU’ s reservation rates and discounts at local hotels click here. Coffee: Students love Cartel Coffee Lab, fondly referred to as ASU’s living room. Up early and craving a coffee fix? Xtreme Bean opens at 5 am and stays open 24 hours on the weekends, another popular student pick. Breakfast: In a rush, grab a croissant or an excellent macaroon at Essence Bakery. Snooze is a popular Denver based retro chain with a seasonal menu. Start the day with a sweet or savory crepe and Oregon’s Heart Roasters coffee at Crepe Bar, where the chef blends French and Southwestern ingredients in a creative fashion. Other students and parent favorites include N-Counter, U.S. Egg, and Harlow’s Café. Lunch: Students head to Nocawich, a casual spot on the edge of campus for signature salads and sandwiches from restaurateur Eliot Wexler. Order the ‘What the Cluck’ fried chicken sandwich or the NY Bagel with lox imported from New York's cult Russ & Daughters on an H&H Bagel. Chop Shop is a healthy spot serving salads and smoothies with nice outdoor seating. For NY style deli fare, plus breakfast served all day, head to Chompie’s. Don’t miss the ‘Big One’ burger at cash only The Chuckbox, an award winning Tempe institution serving fans for over 40 years. Four Peaks Brewing is a student, and local, hangout known for burgers, pizzas and their seasonal craft brews served in a hip, industrial space. Casual: One student raves about the bruschetta boards at wine café Postino, housed in an old red brick schoolhouse in the shadow of Sun Devil Stadium with two patios and a large indoor outdoor bar. Gastro-pub, Culinary Dropout, is a fun spot for great food and creative cocktails served in a buzzy, lively atmosphere. (There’s live music at brunch and happy hour.) Fill up on Ethiopian small plates at authentic, Café Lalibela, where no utensils are needed. You’re meant to scoop up the food with injera, the crepe style bread made from teff making for a fun communal meal served family-style. In the mood for ramen head to Umami while Thai enthusiasts will be well fed at Yupha’s Thai Kitchen. A Step Up: Inventive New American, House of Tricks is everyone’s top choice for a fine dining experience, housed atmospherically in a quaint 1920’s bungalow with a wonderful patio, two fireplaces, and an outdoor bar. (Also a smart pick for an alfresco lunch) La Bocca Urban Pizzeria is another top contender for its trendy Italian vibe, large outdoor patio and delicious Italian fare and artisan pizzas. Late Night Snack: Indulge in made to order ice cream sandwiches on homemade cookies at Slickables, open daily till midnight. Cornish Pasty Co. is a great spot for a quick bite any time of the day. Their signature "pasties" are an English hand pie and a traditional comfort food resembling our hot pockets. Open till 12 am daily, and 2:30 am Thursday–Saturday. Game Day: Fill up on wings, pizzas, and burgers at sports bar Devil’s Advocate; a game-day hangout and a great place to get a taste of school spirit and pride. Local Attractions: The ASU Art Museum boasts an impressive collection of contemporary art with an emphasis on innovative ideas and media. Right on campus, Gammage Auditorium, one of Frank Lloyd Wright’s last designs built in 1964, was named for Grady Gammage, the legendary ASU president. Gammage is one of the “busiest university-based performing arts venues in the world,” check the events schedule before you go. Hike the 60-foot trail at Tempe Butte, known to all as ‘A Mountain’ for the painted ‘A’ at the top. Try and time your walk to be there at sunset for scenic views from the top. Yes, ASU is a big school on a big campus, but classes in my major are small and I have had great professors who are always available to meet. My experiences have been more personal than I had expected at such a large university. The school spirit at ASU is awesome. There is always something happening on campus, there are hundreds of clubs, football games are so much fun and I love having a big city nearby. Its great having Tempe as our college town, I can pretty much walk to everything and jump on the Lightrail when I want to go Phoenix. Just toured the Arizona State Campus? Are you an ASU student, parent or Alumni? 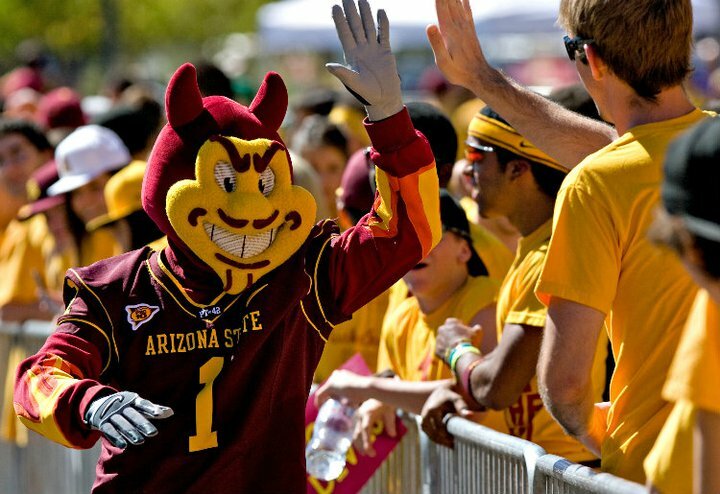 Fill out this 2 minute survey to supplement our Daytripper University Guide for Arizona State!